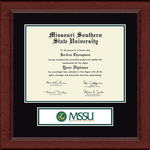 Showcase your diploma in our Sierra frame with your school’s logo and black and tartan green matting. The Sierra moulding is crafted with 100% recycled wood and features a dark mahogany finish. This frame fits a Associate's and Bachelor's degree. Allows you to display your school tassel in a special shadowbox opening alongside your diploma. The black museum-quality matting features your school name and seal embossed in gold. It is framed in our Southport moulding crafted of solid wood with a high-gloss cherry lacquer finish and black accents. Showcase your diploma in our Arena frame with your school’s logo and black and tartan green matting. The Arena moulding is crafted with 100% recycled wood and features a black satin finish. Features the school name and official seal gold embossed on Williamsburg green and gold museum-quality matting. It is framed in Lancaster moulding crafted of solid hardwood with a high-gloss cherry lacquer finish, black accents, and an inner gold lip. It is framed in our Studio Gold moulding crafted of solid wood with a deep mahogany furniture finish and a gold inner lip. 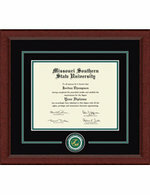 Showcase your diploma in our Sierra frame with your school’s banner and black and tartan green museum-quality matting.